Emma’s own homeware designs include striking florals so this was the starting point of her design. The focus was on creating something feminine, simple and pretty using shades of pink synonymous with the charity’s logo and hydrangeas and snapdragons were the perfect flowers to choose. 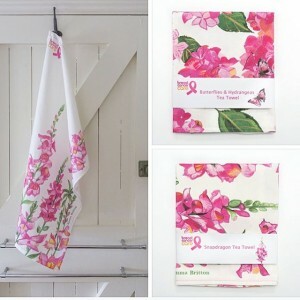 Emma has given them subtle details with butterflies hidden amongst the hydrangeas while the pink stitching on the snapdragon tea towel is integral to the whole design, with accents of orange that again link to the charity’s logo. These crisp fresh cotton tea towels designed and made in England will cost £9 each or two for £15 with profits going to the charity. Breast Cancer Care is the only specialist UK-wide charity providing care, support and information to anyone affected by breast cancer. The charity wants every person affected by breast cancer to get the best treatment, support and information – and this guides everything it does. Emma’s tea towels will launch in time for Breast Cancer Awareness month in October and will then be part of the charity’s gifts selection. Visit www.breastcancercare.org.uk – to order and for more details about the charity.